Natural Matter has great pleasure in introducing NannyCare First Infant Milk 900g. Put simply this is good milk for babies. Easily digested for ‘more-settled’ babies. 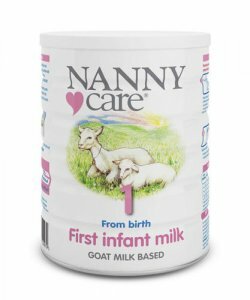 NannyCare First Infant Milk is based on the milk of pasture-fed New Zealand goats which are raised without the use of stimulants, hormones or growth-enhancing drugs. NannyCare First Infant Milk offers a nutritionally suitable alternative to cow’s milk based formulations, and is fortified to ensure that the appropriate nutritional needs of infants are being met. NannyCare First Infant Milk has a unique protein profile which gives rise to smaller, softer curds for easier digestion. The goats are fed on the lush pasture grass of New Zealand. This is compared with other countries where animals are fed grain within intensive farming systems. Use scoop provided, mixing 1 scoop of Nanny to 30ml of cooled, boiled water. Only use under medical supervision. When used to supplement a restricted diet it is advisable to ensure that adequate intakes of all nutrients are provided. Children on milk-free diets may require a calcium supplement. Pasteurised goat milk solids (43%), lactose (from milk), vegetable oils (high oleic sunflower, rapeseed, sunflower), minerals, vitamins, acidity regulator (citric acid), choline chloride, antioxidant (sunflower lecithin), L-tryptophan, L-isoleucine, taurine, L-carnitine, antioxidant (tocopherol-rich extract). VITAMINS: Ascorbic acid, dl-α-tocopheryl acetate, nicotinamide, retinyl acetate, cholecalciferol, calcium d-pantothenate, phytonadione,cyanocobalamin, thiamin hydrochloride, riboflavin, pyridoxine hydrochloride, folic acid, biotin. MINERALS: Calcium hydroxide, sodium citrate, potassium chloride, ferrous sulphate, calcium citrate, zinc sulphate, copper sulphate, manganese sulphate, potassium iodide, sodium selenite.